Home - Advanced Application Design, Inc.
regarding train arrival and departure times. specifically work with your facility and your APM. InfoCenter XD™ digital signage delivers impactful way-finding as well as granular information (countdown by seconds) regarding train arrival, departure and safety messages. InfoCenter station signage is capable of displaying any language, symbol, or graphic element to ensure your passengers that they are going in the right direction. Our ICONS XD™ system is engineered to specifically work with your facility and APM. ICONS has been installed inside some of the world’s busiest airport APMs, informing on-board passengers where they are and what restaurants, shops and services are available along the way. ICONS XD™ is WiFi-enabled, allowing content and announcements to be updated as frequently as needed. We deliver signage and information systems that make it simple to create and distribute targeted messages to travelers on the go. How can Advanced Application Design, Inc. improve your airport, bus, or subway terminal through vibrant, high definition screens? Our focus is on your customer – the passenger. 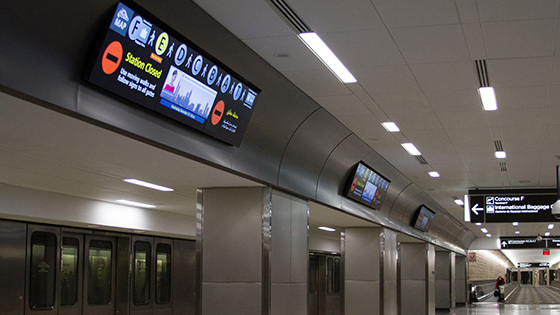 With our signage solutions, you can communicate real-time information that impacts travel, deliver content from your advertising partners, and improve the overall look of your transit system. Connectivity creates the ultimate experience. Learn about InfoCenter and ICONS, our solutions designed to put connectivity first – to destinations, to entertainment, to information, and to each other. 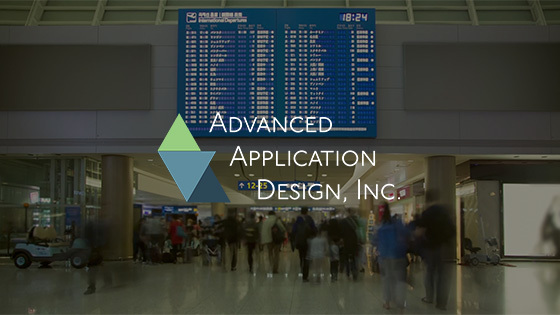 Advanced Application Design, Inc. (AAD) is a world-class provider of digital signage for airports. AAD-engineered solutions are specifically designed and built for airport environments.